When it comes to finding the right storage solution, one of the best options is an outdoor storage shed. We can design and build many styles of sheds for your property, with options available for all budget ranges. You can count on our team of shed installation experts to get the best results for your property. From start to finish, we aim to complete the project to your specifications. See below for the in-depth shed services that we provide. 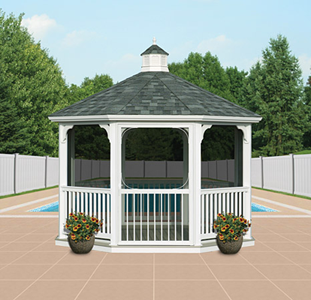 When it comes to outdoor living spaces, one of the best features is a gazebo. Not only does it offer ample shade, it also allows you to enjoy the outdoors in style. There are several different styles of gazebos that we build and install in a variety of materials, including wood and vinyl. Available in all shapes and sizes, we’ve got you covered. Swing sets are fun for kids, but having one custom made for them makes it even more special. We’ve partnered with Swing Kingdom to bring you the best quality, highly customizable swing sets that are safe to use. If you’re looking for something different that will be the perfect play area for years to come, then these are the swing sets for you. In addition to residential swing sets, we also provide commercial swing sets for playgrounds and the like. Our ability to provide swing sets of all sizes for any application. If you’d love to rent To Own Sheds, but can’t afford to buy one outright, we have the program for you! We offer our rent-to-own shed program, where you can find out your eligibility after filling out an application online. Fill out the application, and from there we will be able to offer you custom sheds at an affordable rate.